Literacy remains a contentious and polarized educational, media and political issue. What has emerged from the continuing debate is a recognition that literacy in education is allied closely with matters of language and culture, ideology and discourse, knowledge and power. Drawing perspectives variously from critical social theory and cultural studies, poststructuralism and feminisms, sociolinguistics and the ethnography of communication, social history and comparative education, the contributors begin a critical interrogation of taken-for-granted assumptions which have guided educational policy, research and practice. Foreword. Introduction: How a Genre Approach to Literacy Can Transform the Way Writing is Taught. Bill Cope and Mary Kalantzis. 1. Genre as Social Process. Gunther Kress. 2. Histories of Pedagogy, Cultures of Schooling Mary Kalantzis and Bill Cope. 3. 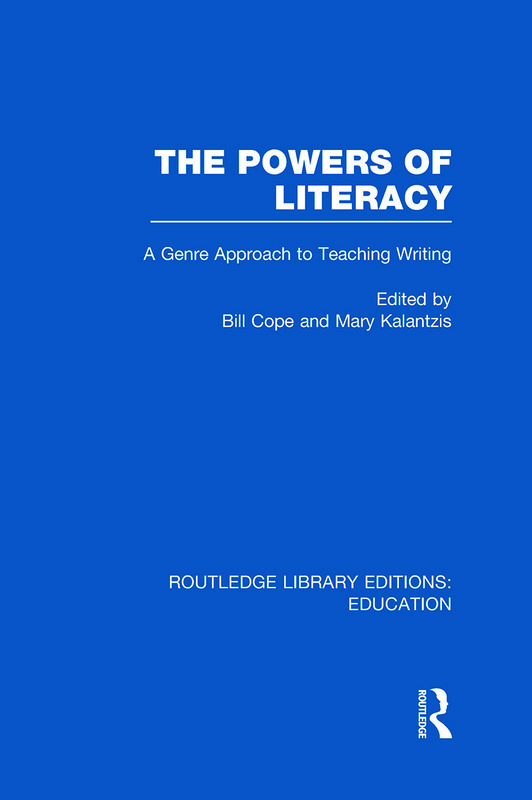 The Power of Literacy and the Literacy of Power Bill Cope and Mary Kalantzis. 4. Gender and Genre: Feminist Subversion of Genre Fiction and Its Implications for Critical Literacy Anne Cranny-Francis. 5. A Contextual Theory of Language J R Martin. 6. Grammar: Making Meaning in Writing J R Martin and Joan Rothery. 7. Curriculum Genres: Planning for Effective Teaching Frances Christie. 8. Genre in Practice Mike Callaghan, Peter Knapp and Greg Noble. 9. Assessment: A Foundation for Effective Learning in the School Context. Mary Macken and Diana Slade. Bibliographical Essay: Developing the Theory and Practice of Genre-based Literacy. Bill Cope, Mary Kalantzis, Gunther Kress and Jim Martin; compiled by Lorraine Murphy.